Ghassemi-Tari, F., Olfat, L. (2008). COVERT Based Algorithms for Solving the Generalized Tardiness Flow Shop Problems. Journal of Industrial and Systems Engineering, 2(3), 197-213. Farhad Ghassemi-Tari; Laya Olfat. "COVERT Based Algorithms for Solving the Generalized Tardiness Flow Shop Problems". 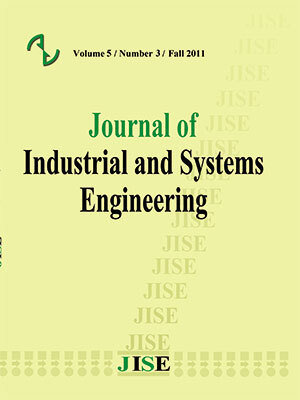 Journal of Industrial and Systems Engineering, 2, 3, 2008, 197-213. Ghassemi-Tari, F., Olfat, L. (2008). 'COVERT Based Algorithms for Solving the Generalized Tardiness Flow Shop Problems', Journal of Industrial and Systems Engineering, 2(3), pp. 197-213. Ghassemi-Tari, F., Olfat, L. COVERT Based Algorithms for Solving the Generalized Tardiness Flow Shop Problems. Journal of Industrial and Systems Engineering, 2008; 2(3): 197-213. Four heuristic algorithms are developed for solving the generalized version of tardiness flow shop problems. We consider the generalized tardiness flow shop model with minimization of the total tardiness as its performance measure. We modify the concept of cost over time (COVERT) for the generalized version of the flow shop tardiness model and employ this concept for developing four algorithms. The efficiency of the developed algorithms is then tested through extensive computational experiments and the results will be presented. discrete processors; Operations Research 40(4); 750-763.
scheduling problems; Computers & Operations Research 26(3); 219-235. Baker K.R. (1974), Introduction to Sequencing and Scheduling; John Wiley & Sons Inc., New York. to precedence-related tasks; Operations Research 26; 111-120.
tardiness problem; Computers & Operations Research 31(3); 397-414. Carroll D.C. (1965), Heuristic sequencing of jobs with single and multiple components; Ph.D.
Dissertation, Sloan School of Management, MIT, Mass. problems; Journal of Operations Research Society 55(8); 830-835.
scheduling problems; Journal of Industrial and Systems Engineering 1(1); 11-17.
completion times about common due date; Operations Research 39; 836-846.
time about common due date; Operations Research 39; 847-856.
scheduling applications; Operations Research 49; 854-865. Naval Research Logistics Quart. 28; 643-651.
of Operations Research Soc. 44(1); 19-28.
problems with earliness and tardiness penalties; Computers & Operations Research 31(3); 317-345.
date penalty, inventory, and machining costs; Computers & Operations Research 28(9); 835-852. Operations Research Society 54(4); 437-441.
problem; Working paper Gs. IA, Carnage Mellon University 38; 82-83. Pittsburgh Conference on Modeling & Simulation; 14; 1245-1250.
flow shop; International Journal of Management Science 24(1); 73-81.
problem; International Journal of Production Economics 64(1-3); 143-152.
and multi-machine scheduling; Naval Research Logistics Quart 31; 325-333.